Thank god for all the color on the streets! How tired I am of seeing all black. I find that I tend to wear the most black when I don't feel like getting dressed in the morning. Either I wake up late or just plain lazy, throwing together an outfit of all to mostly black is easy, almost like a uniform. Just look at beautiful Giovanna and how she stands out against the colorless crowd. Out of all the photos I have seen of her in this outfit this one is the most brilliant and telling. Pop of pinks, Cobalt blue and bright orange have me swooning this season! Giovanna is such a star. She always looks gorgeous & stylish yet so comfortable and not overdone! i always wear black as well, def time to mix it up with some color! love this compilation of street style. Color is definitely the new trend, and what I love is that it is about all kinds of colors. My favorite: the girl with the really long flirty skirt. Another trend are the colorful clutches, this is a trend that I cannot resist. 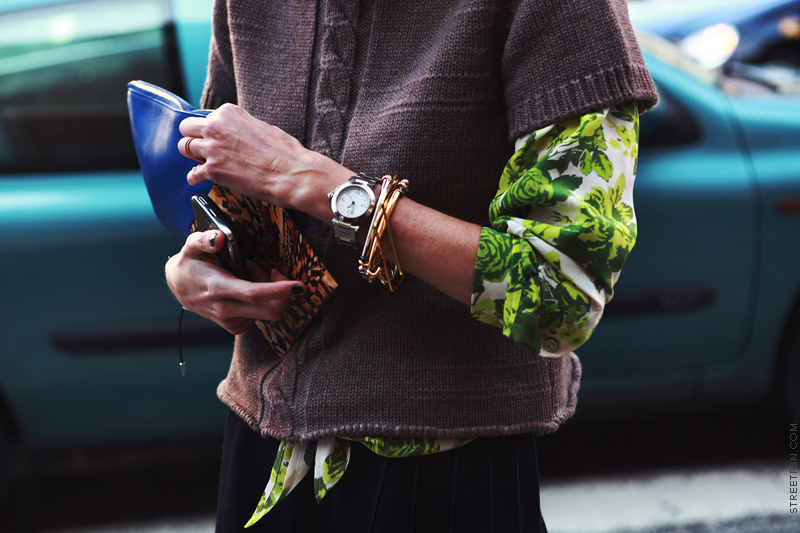 Love the way all the prints and colors are combined. Because I love you girls, I am following you on your blog and via blogloving. You are also on my blogroll. So thanks again for your lovely comment. thanks for the inspiration! i can't wait to add some of these colors into my wardrobe! This really gets me into the mood to sport those fluorescents for spring! That green pic is my fav, its like she is from the emerald city....love it! This is major outfit inspiration. Also, I need those green gloves. Desperately. Perfect post. Love it ! Totally agree that people dress a bit too colourless, especially during winter. Even I do it, half the reason cause black so easily looks good, and half cause when I buy clothes I need to prioritise stuff I can match with more... which tends to be black stuff. this is absolutely brilliant. i love the bright long dress beneath the leather where they caught the shot from behind. yowsa that is a gorgeous photo. i'm like you - reverting to dark when i can't be bothered. or when i'm depressed. so over dark colors right now. Ohmygosh yes! I love this post! So inspiring, and soooo making me want it to be spring! I absolutely loooove this post and these colors !!! love these photos espeically the one with the prada monkey. Your blog is amazing! I love the green coat and the pink blazer! thanks for your support V&C! now following you, would really appreciate you following me as well, thank you!!! me too! love love love color! Wonderful! I really love the second pic! I couldn´t agree more with you: colours, colours everywhere fill my heart with joy. Thank you for each and every pic, such a wonderful present. oh Ilove that green coat! You have an adorable BLOG of Fashion. LUV LUV. I'm out to see more! since i became a big fan of camel color this fall, now i have to think twice about to fill my closet with some colour items..yeah, definitely for this summer!! So colorful post! I love it!!! Oh my gosh I'm loving the colors, textures, and patterns in these looks! These women look amazing, and they definitely know how to rock it! Great post! You have an amazing blog! I love these pictures, Abbey is so perfect! I'm with you on the color thing. I absolutely love it, and it's making me anxious for spring to come! Your blog is so cute, I'm definitely following it. Love it and love it! this post is wonderful....colors are the most important thing in my life...and now than summer is just a round the corner we need to capture all the good energy that it comes with bright and fabulous colors!!!!! Come to visit me, I'm BACK!...and thank you for your lovely comment! What a bright an cheerful post. I love those inspiring outfits and colors. Can't wait for warmer days to arrive in Germany, so I can pull out a few colors out of my wardrobe. Oh I really love this suit Giovanna is wearing! stunning! Love this photos and the green coat and gloves, and also think that Giovanna Battaglia is diferent and this photo shows it. Thank you for your nice comment... I'm always glad to hear from you. Great colors for spring! These outfits are so passionate and lively.